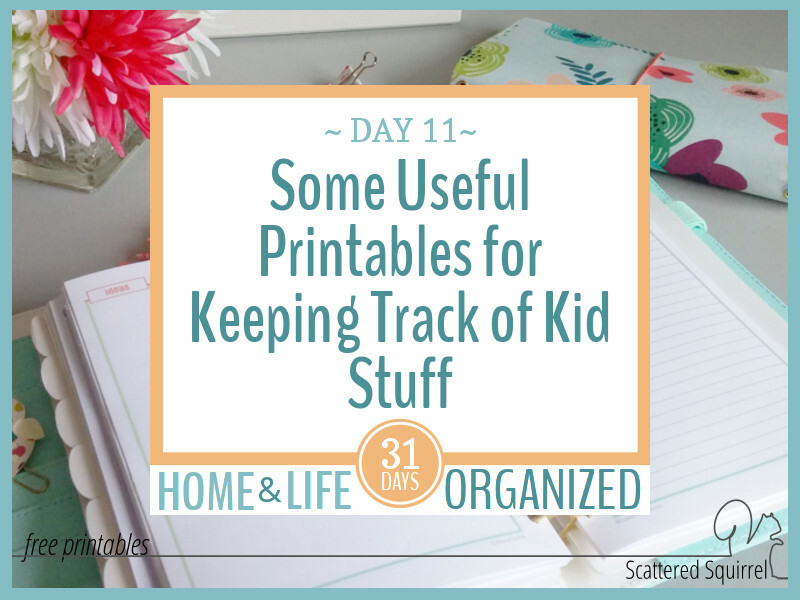 I don’t know if your home is the same as ours, but it seems like there is an awful lot of information I need when it comes to keeping track of kid stuff. Between school forms, sports and activities, friends, and hobbies, I could probably create a whole binder just for them. Most of the information I keep in the Kids Section of my home management binder comes from outside the home so I really only needed to make up a couple printables for this section. Before I jump down to the printables I wanted to take a moment to explain how I set this section up. I use tabbed dividers to help separate the sections of my binder. I find that having the tabs works well for quickly flipping to what I need. After the main divider, I use these folders to create a subsection for each of my boys. Using the folders for the subsections allows me to tuck in papers that can’t be hole punched and I don’t have to worry about losing them. Now that I’m switching to a half-size HMB I’ve been on the hunt for divider pages that will fit. I found these ones for a fantastic price – Avery Mini Write-On Plastic Dividers for my main dividers and these C-Line ones that I really like for the subsections. They’re a little more expensive, but you can get them in three different sizes, which I think is fantastic. I know I could probably make my own, but for right now I just want something that’s ready to go. 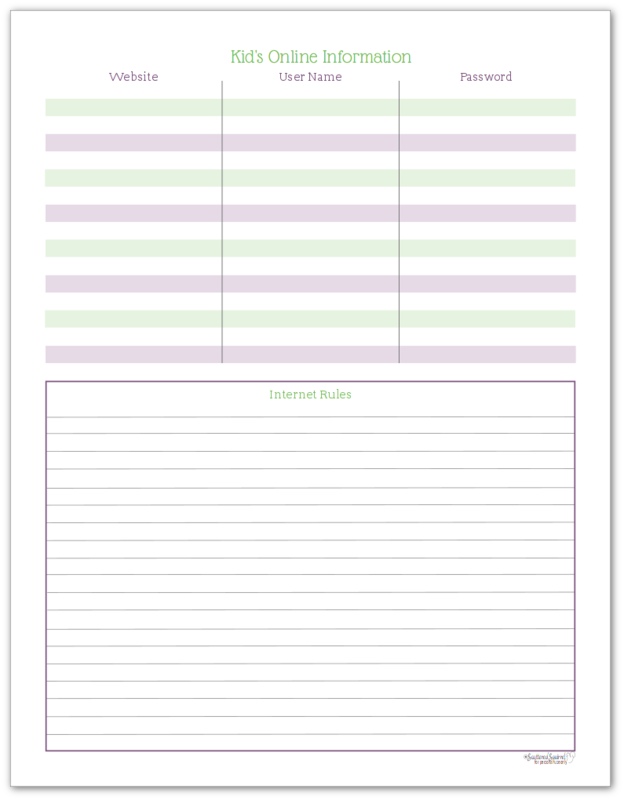 Each boy’s section starts with the printables you will find below and then I store everything else after them. If I need to organize the sections more I just use sticky flags to mark the pages. This one is probably one of the most helpful ones I have. 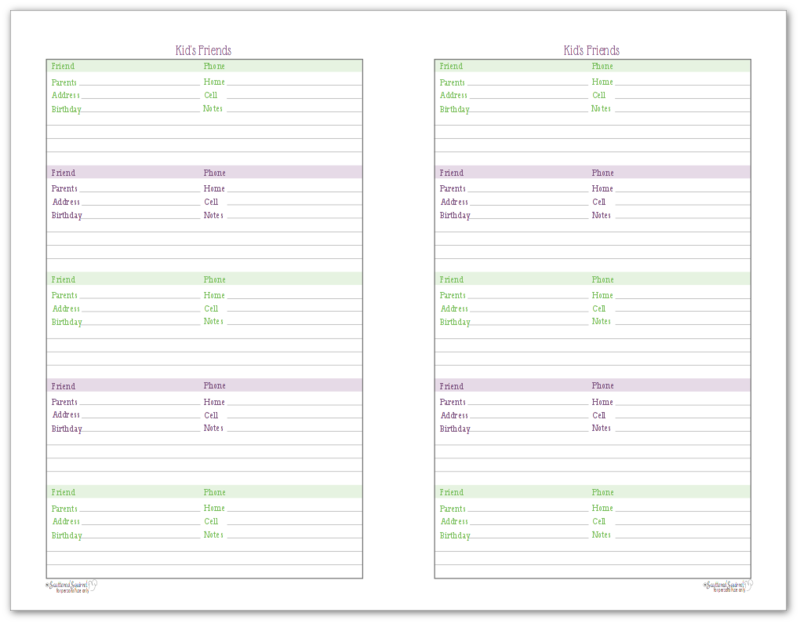 It allows me to keep track of my boys’ friends, who their parents are and a few other helpful details. It’s a fairly straight-forward page. All the essential contact information is there, plus a spot for birthdays (because that’s always important to remember) and a place for notes. I make note of things like food allergies, kinds of movies they are allowed to watch, etc… to make sure that I don’t forget someone isn’t allowed to watch movies about frogs or eat peanut butter or what have you. You might also notice that there is room for three different phone numbers. This is the age of cellphones, and at a certain age, I noticed many of my oldest’s friends started getting cell phones. Our oldest was one of the last of his friends to get a phone (he didn’t want one) so I had him record his friends’ numbers here so that I could reach him in case an emergency happened while he was out with his friends. This one has been a staple, in one way or another, since our oldest first ventured into the online world. Our biggest rule was that we needed access to all online accounts. You can never be too careful, and we wanted to make sure that both of our boys know that we will hold them just as accountable for their online behaviour as we do for their offline behaviour. 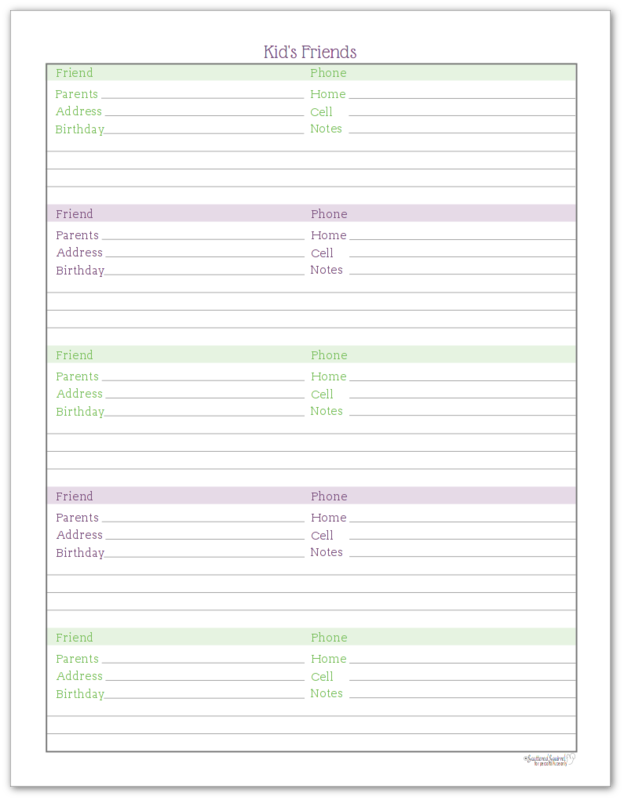 So this printable gives us a place to keep track of the sites they use and their user names and passwords. Having a place to jot down the rules for internet use has proven to be very helpful in diffusing the argument of “you never told me that”! It’s harder to argue when it’s written down. Every once in a while, we go over the rules with the boys to make sure we’re all remembering them. Having a section for keeping track of kid stuff has come in so handy over the years. I update this section every couple of months, making sure our friends list is up-to-date and new web accounts are added and old ones crossed out. Every time a new notice or report card comes home I go through the school papers to make sure they’re still applicable. Same thing with sports and other activities. When the season is over I see what needs to be saved and what can go. This way I know the information is fairly current. 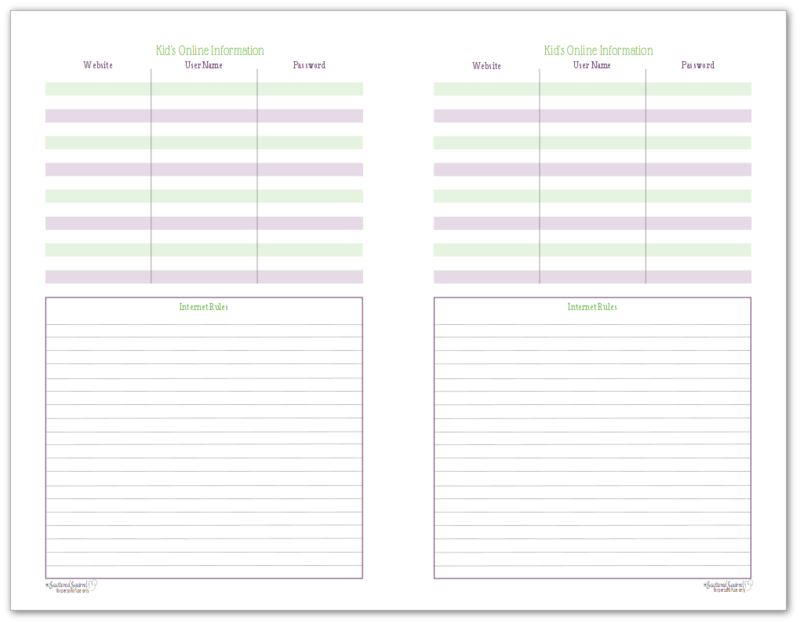 As always, to grab a copy of these printables for yourself just simply click on the pictures of the ones you would like and the PDF version will open for you. I’d love to hear your thoughts about these. Will these be helpful for you? Do you have rules regarding internet use in your home? Drop me a line in the comments below and let me know. please know how appreciated you are. thank you so much. you are a beautiful person. Thank you so much for your kind words Donna. They brightened my day! You help so many of us who struggle to stay on track. Thanks for your work.